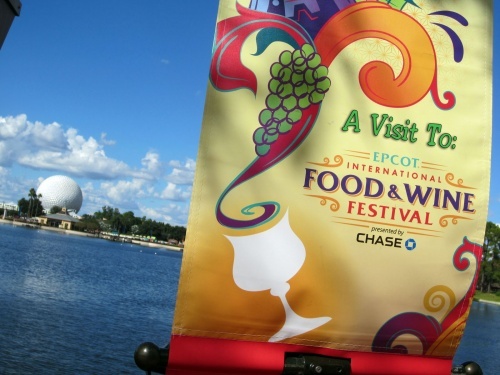 Getting ready to fly to Walt Disney World or Disneyland? 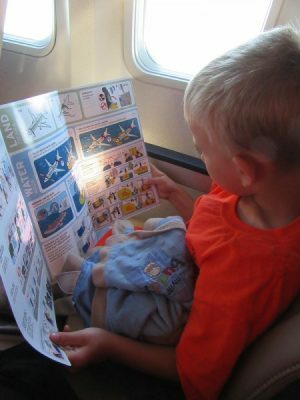 We have some great tips for before and during your flying experience to help prepare yourself and your kids for a fantastic flying experience. Paperwork: make sure to get all the paperwork you might need. Adults will need their identifications. 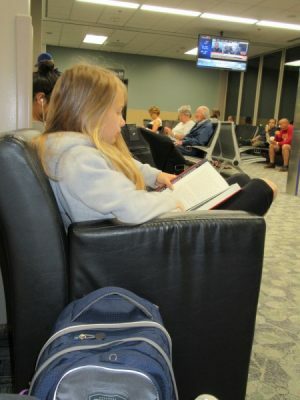 Kids under 18 do not typically need paperwork; however, if you are flying with lap children, those that don’t need a ticket, I would suggest have some sort of paperwork such as birth certificate to show TSA. They do sometimes check for safety. 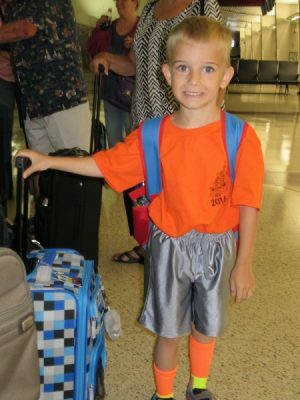 Practice: if you are planning on having your kids carry luggage of their own such as a backpack or pull a carry-on, I would recommend that you practice before heading to the airport. Make sure backpacks aren’t too big or small and that they understand how to pull their carry-ons. This will save you some headaches at the airport. Mark your bags: you will be amazed at how many suitcases look just like yours when flying. Make sure to take sometime to mark your luggage. All of your luggage. This means checked bags, carry-ons, and backpacks. You can get as creative as you want here. There are a lot of neat ideas out there but in the end tie some ribbon on the bags to make it stand out. Packing: before heading to the airport, make sure you know where to pack everything. First, always double check TSA rules when it comes to carry-ons. Remember liquids are limited for all travelers to the 3-1-1 rules. Liquids aren’t the only thing that is limited, so if you are unsure what is allowed jump on their website and get some answers. Also a big suggestion when packing is to always make sure you have all those important items with you and not checked. Items like electronics, swimsuits, medicines and other quick access items need to be carried on with you just in case something happens to your luggage. Finally with packing, make sure to communicate to everyone flying with you where items are packed. This helps the kids know where their toys, snacks and special items are preventing some meltdowns. It also helps grown-ups when going through security that everyone knows where the liquid, computers and other important items might be. In the past, I have actually used yarn to mark different zippers so it was easy to remember where items were packed. For example, I knew medical items were in the red zipper and blueSe meant snacks. Seemed silly but it helped with I needed to tell one of kids to get something I knew where it was and could tell them a specific color instead of trying to explain which zipper pocket. We always like to get to the airport super early to avoid the stress of rushing and running through the airport. I highly recommend doing this to prevent your trip from starting off under stressful situations. When it comes to security, it can be super stressful. I remember the first time we flew with both kids ages 4 and 2 at the time. We had so much stuff to get through security. Two strollers, two suitcases, two backpacks, one small backpack, and my purse. It was so overwhelming. Step one in this situation, maybe not pack so much. Someday I will learn to not pack so much. We learned that having of adult go first is the best so they can gather on the other side. The other adult can stay back and remove items such as liquids and electronics that need to be. Another tip for security that I always forget about is thinking through what I am wearing. I like to dress in layers; however, when it comes to airport security this can be troublesome. You are not typically allowed to wear jackets, coats or even larger sweatshirts through security which means more items to put through and pick up. Also you will need to remove shoes as well so think that through as well. If you are frequent flyer, you might look into the new pre-checked option prior to flying. Even though it takes some time and money, many have found it to be worth the investment. Now that you have made it to your gate, you might have a few hours to wait before boarding. Make sure to have some entertainment planned for this time as well for kids. We actually do electronic time while waiting as there are often areas to plug-in and airports often have Wi-Fi as well giving more options. 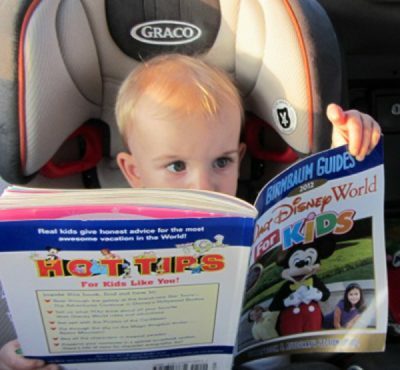 Our kids enjoy reading as well as coloring so we often use these while waiting. You can also get creative and make a I-Spy for airport that could keep them entertained while waiting. As it gets closer to boarding time, make sure to make a few stops at the restrooms before boarding. This is also a good time to refill water bottles but make sure that yours isn’t one that the cabin pressure will cause to leak or overflow when opened. We had a little one with wet pants because of this and it didn’t make for a good take off experience. Now that you have gotten through security, made it your gate, waiting hopefully patiently, and loaded the plane, it is time for take off. Here are some tips for the actual flight. The first tip is to be prepared for takeoff and whatever that might mean for your family. I am fine taking some Advil and chewing gum. My husband on the other hand needs to take Dramamine and have gum during takeoff. 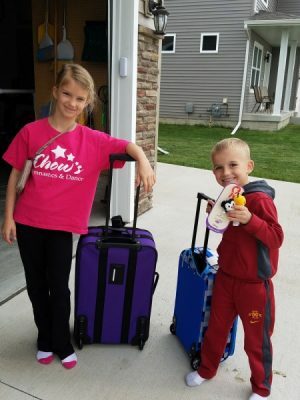 When we first flew with our kids, they both had ear infections that they were recovering from so our doctor suggested a decongestant prior to takeoff and Tylenol. You might want to have that conversation with your pediatric doctors before leaving. On our most recent trip, the kids were good eating gummies and having a sucker. Everyone is so different when it comes to how they are impacted by takeoff so I always plan for the worse and hope for the best. Once up in the air, you will need more entertainment for everyone. My husband loves to put the headphones in and listen to music. For our kids, we use the flight as a way to get the excitement and set the stage for the rest of the trip again. We often play games such as “name that ride” where we give clues for different rides or shows at Disney. We also purchase planning books ahead of time that we bring along as well for them to read one more time. Search and find books or workbooks are also popular with our kids as there is so much to do. We also have movies but sometimes electronics don’t cooperate so have a backup plan. 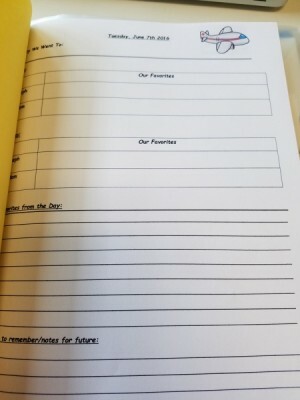 On the way back, I always have journal sheets that the kids fill out about the trip. Not only does it keep them busy, but it is a great way to talk about all the memories that were made. Other great free downloadables can be found here that can also help. Although you should get a little snack on our flight, I always pack some just in case we either don’t care for the snack provided or need more than what is provided. 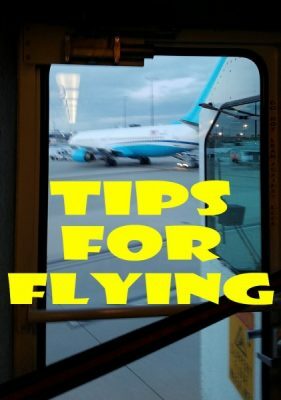 These are just a few tips to help your flying experience go as smooth as possible and getting your vacation off to a magical start. What are your best tips for flying? Share them in the comments.